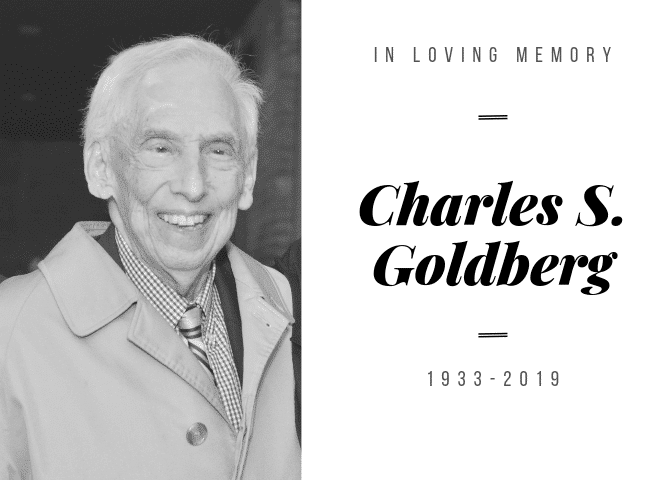 The Steinberg Law firm is saddened to announce the passing of our partner, our friend and our mentor, Charles S. Goldberg, Esquire, on February 13, 2019. He brought dignity and grace to the country, community and profession he loved and served throughout his life. Born in Charleston on December 16, in 1933 the son of George and Jeannette Goldberg. A first generation American he never forgot what his grandparents and parents endured to come to the United States. He served his country honorably in the United States Army as Spec 4 during the Berlin Wall crisis and later as a commissioned Captain in the JAG corp. When asked to describe his life, family, friends and colleagues say he was first devoted to his family. He was married to his beloved wife, Harriet Lauper Goldberg, for 58 years. They raised two sons, Steven, who followed his father into the law and practices with the firm, and Michael, a businessman who lives in Dallas, Texas. His pride and joy in retirement were his six grandchildren who he joked were enough to make up their own basketball team. Mr. Goldberg graduated the University of South Carolina and USC School of Law. Before joining the Steinberg Law Firm on Broad Street in 1970, he practiced real estate, civil and criminal law. A tireless fighter for the rights of his clients he practiced probate, heirs property and personal injury with the firm for over 40 years. He was the President of the Charleston County Bar Association, Charleston Lawyers Club and served leadership positions on many other professional organizations. As a member of the firm he helped establish the South Carolina Association for Justice and the Injured Workers’ Advocates to help preserve our civil justice and workers’ compensation systems. Mr. Goldberg remembered how the older, more experienced lawyers used to meet at Byars Drug Store on Broad Street each day at 10:00 a.m. to discuss cases and give advice to young lawyers. Together with Judge Duffy and the Young Lawyers Division of the South Carolina Bar, Mr. Goldberg helped organize and launch a program called Bridging Broad Street to mentor young lawyers just starting out. Mr. Goldberg was a fixture on Broad Street admired by judges and lawyers alike. He truly was a gentleman lawyer willing to give of his time and talent to help a client or fellow attorney in need. Even lawyers he opposed in Court praise his legal skill, integrity and professionalism. Mr. Goldberg not only served his profession, he served our community. He served as the Chairperson of the City Planning and Zoning Commission appointed by Mayor Riley, President of the Jewish Community Center, Synagogue Emanu-El, The Hebrew Orphan Society, Dan Lodge and B’nai Brith. His life personified the requirement to do justice, love mercy, and walk humbly with your God. It is often said Mr. Goldberg always showed due regard and respect for the feelings, wishes, rights or traditions of others. Funeral services will be held at Synagogue Emanu-El, 5, Windsor Drive, Charleston, South Carolina on February 14, 2019 at 1:30 p.m. Burial will be immediately following at the Emanu-El Cemetery (Maryville). Memorials may be made to Synagogue Emanu-El.